Any DVD Cloner enables you to burn a single-layer (DVD-5) or a dual-layer (DVD-9) movie onto one single-layer D5 or dual-layer D9 DVD+R/RW DVD-R/RW disc. Shrink a dual-layer (DVD-9) movie into one single-layer (DVD-5) DVD+R/RW DVD-R/RW disc. Video and audio quality is guaranteed to be the same to source DVD no matter which backup mode is selected. Any DVD Cloner provides "DVD Folder" as Target. Users can choose this option as output so as to backup DVD content on local hard drive disc. That would be much convenient to watch movies by playing the files with a media player software such as VLC media player or KMPlayer on computer. Besides DVD Folder, the program also provides ISO Image File in "Target". DVD will be saved on local hard drive disc as an ISO file (a .zip file) for this option. It supports many DVD burner such as DVD-R / DVD-RW / DVD+R / DVD+RW. Shrink DVD9 movies and compress it to a regular DVD5 DVD-R/RW or DVD+R/RW with the same quality to original DVD both in video and audio. You can select any titles, chapters, main movies, menus, special clips, languages and subtitles to backup or shrink up to your preferences. Any DVD Cloner supports DVD-R / DVD-RW / DVD+R / DVD+RW burners. It works pretty well with DVD+-R/RW, DVD-RAM, most DVD players and burners. And there won't be scratched or damaged DVD any more and you can enjoy any DVD movie anywhere at any time. There are 4 easy and flexible DVD backup modes available to burn the DVD as you like. It is one of the best and most powerful DVD backup tool for movie-lovers. 8) Erase DVD: click this to erase written DVD-RW or DVD+RW independently. 9) Temporary File Folder: click the browse button to change the folder with sufficient space for the copying. Burning a DVD to DVD/ISO Image File/DVD folder, temporary hard disk space will be required. If there is no enough temporary hard disk drive, DVD backup may fail. 1. How to Burn DVD Movie to DVD-/+R (DVD5/DVD9)? 1.1 Insert DVD into DVD burner. 1.2 Click "Open DVD" to load the source DVD into program. Note: If you have more than one DVD-RW drive, you can choose another drive. If you have only one DVD-RW drive, you just need to choose the same DVD-RW drive your DVD movie has been inserted. Burning a DVD to DVD/ISO Image File/DVD folder, temporary hard disk space will be required. If there is no enough temporary hard disk drive, DVD backup may fail. Click "Browse" to select a folder. Make sure the drive which contains this folder has enough free space. For burning a DVD9, 8.5 GB is required. If the output DVD folder or ISO image is in the same drive as temporary folder, 16GB will be required. 1.4 Select titles for backup. All titles are selected once loading in the program. Users need to check the titles for backup and the unchecked titles will not be saved. Above screenshot are for all titles are selected. Users can select "The Longest Title" only for the main movie. Processing time and space will be saved if copying the longest title only. 1.5 Make sure target DVD size is selected in "Options..."
For burning DVD to blank DVD disc, need to make sure the target size DVD is selected corretly. If you want to burn a DVD to blank DVD5, please select "DVD-5" while "DVD9" is for a DVD9 blank disc. Click "Copy DVD" or "Start" button to start DVD copying process. 2.1 Choose correct burner in "Input Device" and load titles in the program. Insert DVD into DVD burner, then choose the burner in "Input Device", click "Open DVD" to load DVD titles in Any DVD Cloner. 2.2 Choose Target Device - ISO Image File. Once you select ISO Image File as the output target to backup a DVD, an ISO Image File (.zip) will be generated finally when the copying is finished. Note: Burning a DVD to ISO Image File, temporary hard disk space will be required. If there is no enough temporary hard disk drive, DVD backup may fail. So, please make sure a folder with sufficient space is selected as "Temporary File Folder" for burning a DVD to ISO Image File. Click "Settings"-->"Options..." to change temporary folder in the popup dialogue. 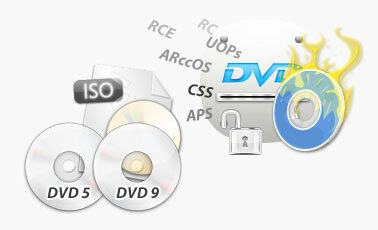 For burning a DVD9 to ISO, 8.5 GB is required, while 4.7 GB is required for burning a DVD5 to ISO. 2.3 Select the titles only you want to preserve. 2.4 Start Burning DVD to ISO. Click "Copy DVD" or "Start" button to start burning DVD to ISO Image File which will be saved on your hard drive. 3.1 Choose correct burner in "Input Device" and load titles in the program. 3.2 Choose Target Device - DVD Folder. Once you select DVD Folder as the output target to backup a DVD, a folder contains two sub-folders (video_ts and audio_ts) will be generated finally when the copying is finished. Note: Burning a DVD to ISO Image File, temporary hard disk space will be required. If there is no enough temporary hard disk drive, DVD copying may fail. So, please make sure a folder with sufficient space is selected as "Temporary File Folder" for copying a DVD to DVD Folder. Click "Settings"-->"Options..." to change temporary folder in the popup dialogue. For copying a DVD9 to ISO, 8.5 GB is required, while 4.7 GB is required for copying a DVD5 to DVD Folder. 3.3 Select the titles only you want to preserve. 3.4 Start saving DVD as DVD Folder. Click "Copy DVD" or "Start" button to start saving DVD as DVD Folder which will be saved on your hard drive. Wait for a while, then DVD Folder is created! Any problem with backing a DVD movie using Any DVD Cloner, please send us the dvdcloner.log. 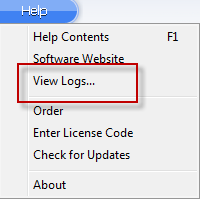 You can find the log file by clicking "Help", and clicking View Logs. To contact us, please send email to support [at] any-video-converter.com (replace [at] as @).